Today is the official launch of the 2015 Edinburgh programme. I’m thrilled to be bringing my new show — my debut stand-up hour — to Stand 4. 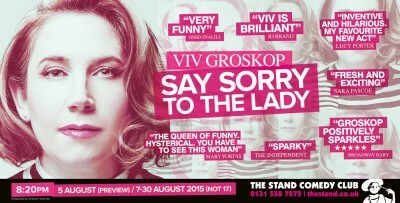 The show is SAY SORRY TO THE LADY and it’s all about the Great British cult of apology. Why do we say sorry when we don’t really mean it? Why don’t we say what we’re really thinking? And can it really be true that the average Brit apologises – according to one survey — 1.9 million times in their life. More news of previews coming soon. Edinburgh with Tony Law is on June 30. Bristol is on July 9. Latitude is on July 17. Pics by Idil Sukan/Draw HQ.